However, because licorice root contains glycyrrhizic acid, it can raise blood pressure when used on a frequent basis. 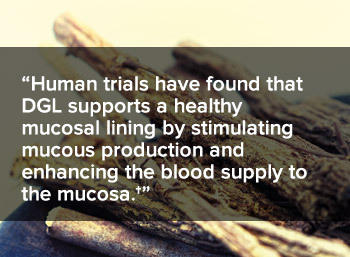 Since a healthy stomach lining does not depend on glycyrrhizic acid, a specialized formula known as deglycyrrhizinated licorice (DGL) alleviates this risk. Baker ME. Licorice and enzymes other than 11 beta-hydroxysteroid dehydrogenase: an evolutionary perspective. Steroids. 1994;59(2):136-41. Kim JK, Oh SM, Kwon HS, et al. Anti-inflammatory effect of roasted licorice extracts on lipopolysaccharide-induced inflammatory responses in murine macrophages. Biochem Biophys Res Commun. 2006;345(3):1215-23. Morgan AG, McAdam WA, Pacsoo C, et al. Comparison between cimetidine and Caved-S in the treatment of gastric ulceration, and subsequent maintenance therapy. Gut. 1982; 23(6): 545–551. Turpie AG, Runcie J, Thomson TJ. Clinical trial of deglycyrrhizinized liquorice in gastric ulcer. Gut. 1969l; 10(4): 299–302. Whiting B, Thomson TJ. Deglycyrrhizinated liquorice in duodenal ulcer. Br Med J. 1971;4(5778):48.